I'd like you to be a Savvy Investor. Here are three goals you should have and tell me about them, so I can help you hit a home run? My contact info is at the top of the screen. Have clear goals for your investments. I've noticed a Savvy Investor has run the numbers, and they have a time frame for how long they're going to hold a property based on the next two goals. They will have a realistic approach to the future appreciation and those expectations will typically be based off of logic and data. They're not trying to hit a home run each time they step to the plate. Instead, their plan includes a lot of times at the plate and a continuous flow of base hits. When I ask a great investor what type of performance they're looking for, they will tell me EXACTLY what works for them. They have this down to a science, because if the performance works, the expectations work, and their time frame for owning or selling is met. Be logic based and unattached. Experienced investors create a plan that is profitable and then find a property that will fit the plan. Novice investors put a plan together that is based more on the type of property they think they want and try to created a solid investment plan for a bad investment property. They understand that holding a bad investment doesn't make it a good investment. If a property is good at the beginning, it will perform well and be profitable when it's sold. A property purchased wrong will always be wrong. In past markets, investors lost site of the current performance and made decisions to buy based on the potential for future appreciation. For a period of time it worked. This is why so many, get rich quick, home investment books were written. Now, a buyer/investor buys a property that makes sense today, plans for and is OK if there's a downturn in value, cash flow, etc. in the future. They don't include potential appreciation in their strategies. If it happens, it's simply a BONUS. When FLIPPING properties a novice buys improves, and tries to sell. If any of the variables that are typically out of the buyers hands change, the sale doesn't happen and there's a significant risk to the buyer in owning that property. Savvy Investors will buy properties and flip, with a 2nd and 3rd exit strategy, if the sale doesn't work. I'm working hard to make sure my little blog is helping you make more informed home buying decisions. When you're ready step up to the plate, reach out by writing me a message below? Ask me for my "favorite resources," so you'll have the tools to realize your investment strategy? I want to be your real estate broker and will make sure your home investment is a home run. 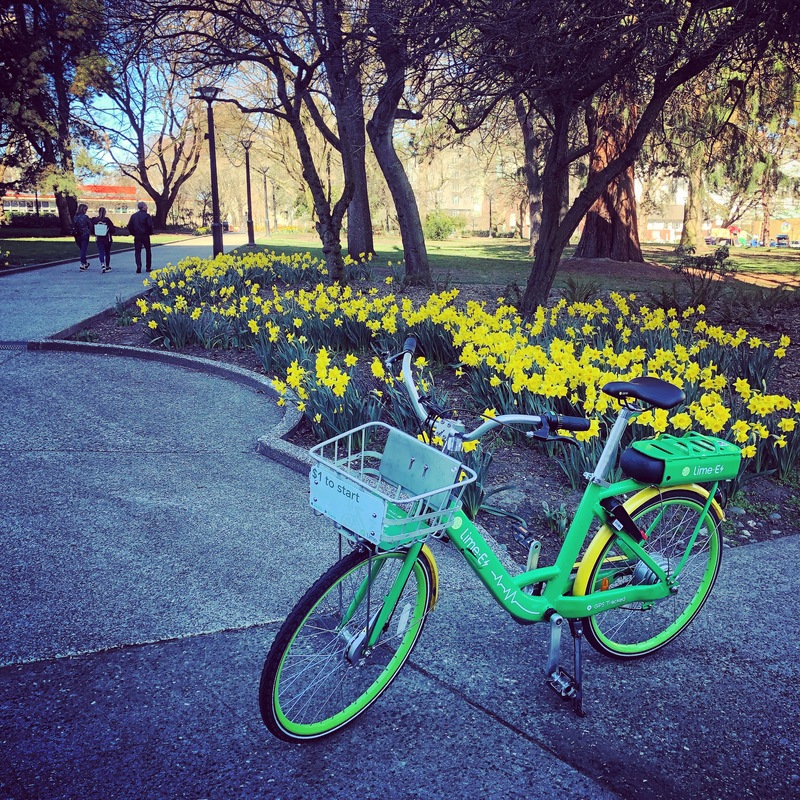 If you haven't had a chance to see all of the daffodils along Bell Street in Belltown and at Denny Park in Seattle, I suggest you see them ASAP as they'll be gone soon. 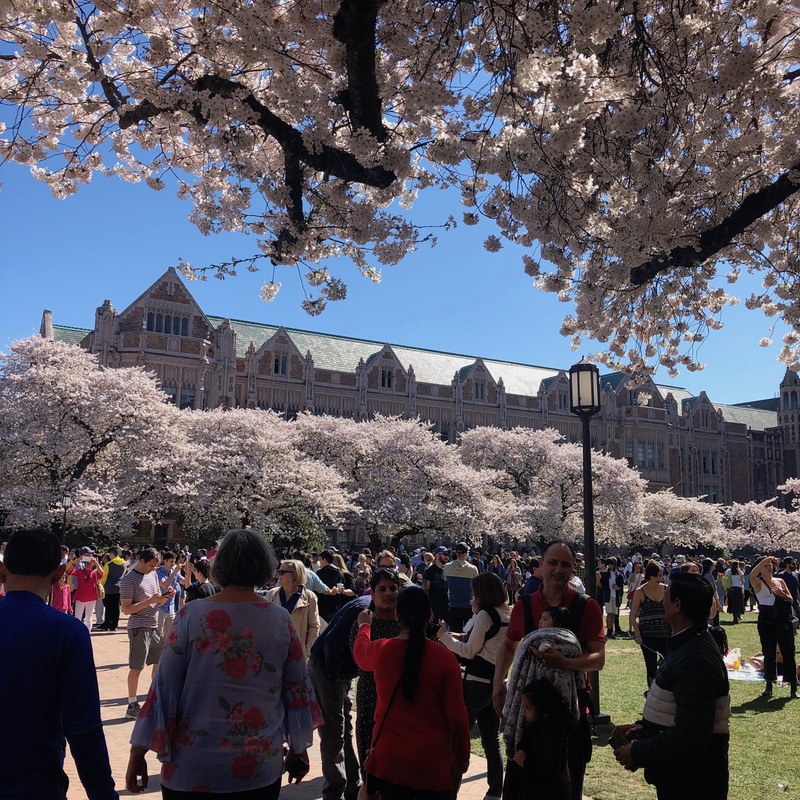 Take a picnic to The University of Washington's Quad, it's glowing with cherry blossoms. I think the fresh warm air made my food taste better too. This coming week, play hookie with some friends (I'm doing this mid-week) to see the tulips at Skagit Valley. Do read this very funny news article by: The Stranger and don't forget to poop before you leave town! Property that SOLD: March sales were down 15.8% from this time last year and 12.7% higher than last month. Property Currently for Sale: The total amount of property available went higher by 106.8% from this time last year and 17.4% higher than last month. Meaning there's more for buyers to choose from. Property under Contract (Pending): March homes under contract increased 8.3% from this time last year and 72.3% higher than last month. Average Sold Price per Square Footage: Shows we're appreciating. March was at $370 this was up 4.5% from $354 last month and down 1.1% from $374 in March of last year. Days on Market: Is showing a neutral trend. 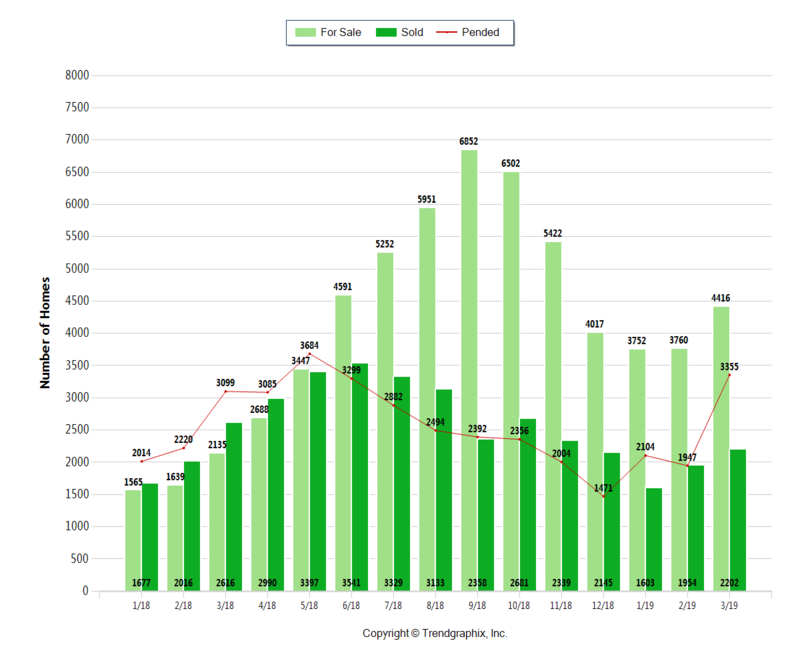 Upward trends show a buyer's market and downward shows more of a seller's market. The DOM for March was 42, down 16% from 50 days last month and up 110% from 20 days same time last year. Sold/Original List Price Ratio: Is remaining steady at 98% is up 2.1% % from last month and down from 4.9% % in March of last year. This ratio shows you how willing sellers are to agreeing to come down from their original listing price. Above 100% shows a Seller's market. Months of Inventory based on Closed Sales of 2: Increased by 147% compared to last year and up 5.2% compared to last month. March 2019 is Seller's market. Home affordability continues to be the big topic of 2019. Obviously, there are already signs that show our inventory is improving. 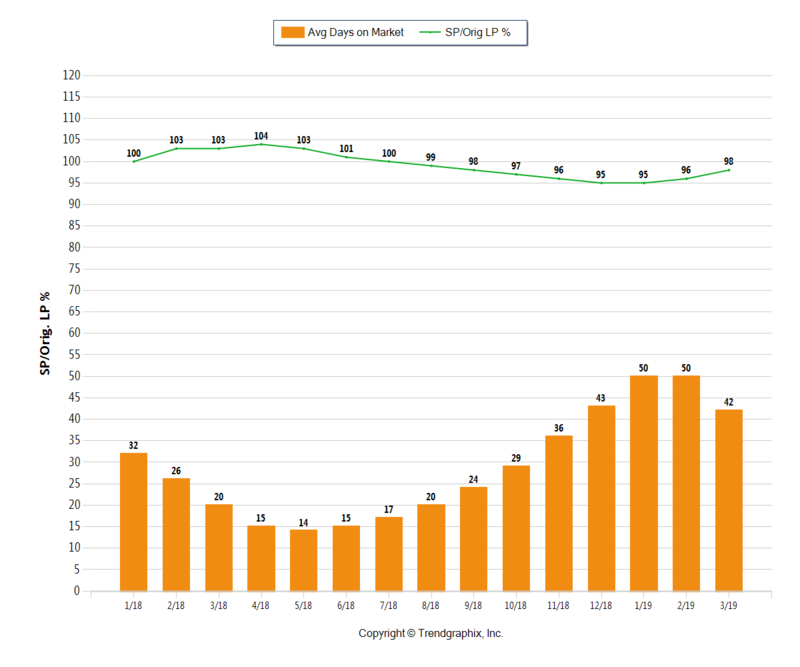 There are even areas showing a year-over-year increase in value (find yours by clicking here). If you're a motivated buyer, and you're already looking at annual goals, there are many new homes coming onto the market every day. Let me know when you're ready to start looking? I've got great backend information! Remember, I'm working hard to be your only Realtor. Make contact with me when you're ready? Let's face it, the more you know about the environment you're negotiating in, the better deal you'll get. Having a Realtor who understands the landscape is important to getting a home for better than market value. Negotiation begins before we write and present the offer. It's important to communicate expectations to show them you care and paint a picture of who you are. This will help the seller see you are different from the competition. Many times the seller just doesn't have the cash to give you cash back for the repairs needed to the home. If we ask, there's a good chance they'll lower the pre negotiated asking price of the home in leu of the repair. Buyer be aware, if they've already disclosed these repairs, they're less likely to make a concession. On the flip of the coin, if you've already run your appraisal, you may not want to change the value of the home, in fear the appraiser will come back out and agree with your assessment of the home and lower the value, in turn lowering your ability to borrow as much of the home. May times all buyer thinks about is the offer price presented and trying to bring that number down. Once issues are spotted with the home, instead of asking them to lower the asking price, maybe ask them to pay for some of the closing costs. Having a seller who's willing to work with you by giving you an ability to round your closing costs into the loan can also be very valuable. Just remember, many lenders will only allow a 3% cash back allowance for closing costs. It's important to communicate with your loan agent and set realistic goals for the up-and-coming negotiation of the purchase agreement. Most of all, always remember, a Great Negotiator can assist you in buying under market value in many cases. A Poor Negotiator can cost you thousands! When you're ready to plan your purchase, contact me, I really want to be the best Seattle Real Estate Broker for you! Negotiating a property to the best possible price is one way to build instant equity into your property. Remember that buying the property right is the key to your real estate investments. So, how do you get a seller to take less than they should? Without the most relevant information regarding property values, market trends, upcoming development etc. you can't be fully informed. Knowing the ins and outs of the local market is the only way you can make the best decision. I'm a full time agent, and I'm working the market every day and have a knowledge base that extends beyond the actual property, as well as the potential pit calls that could surround a home that looks good on the surface but may cost a new buyer as yourself, thousands in the future. Buying without a business plan for your property is like purchasing your car because of it's color and wondering why the dumb thing is such a money pit. Many buyers make decisions based off of everything EXCEPT their plan for the home. In order to make the best purchase choice, the property should fit your plan. Your plan should include variable such as, HOW LONG WILL I OWN THE PROPERTY? WHAT IS IMPORTANT ABOUT THE PROPERTY IF I RESELL IT SOONER THAN I THOUGHT? WHAT TYPE OF FINANCIAL PERFORMANCE DO I EXPECT FROM THE PROPERTY? (Future appreciation, income potential, etc). In my experience, many people will have a plan for their purchase up until the point they start looking. And a plan doesn't really mean you're asking Santa for all of your favorite features. It means, plans for the future. Because there are always so many choices when you're buying, you can be tempted to abandon logic. Rarely will a property's performance change if it didn't already fit what you were trying to accomplish. It's human nature to become emotionally attached to a home that you like, especially if it's something you're going to spend a lot of time enjoying. It's important to establish your top dollar, before we begin negotiating. That top dollar will be based on LOGIC. If, during the negotiation you determine that you want to abandon the logic and spend more, at least your decision will be a conscience decision. If you get caught up and pay too much without prior analysis, you may find out in hindsight you overpaid for for that home. Depending on King County's market appreciation and the value of the property, this could mean an additional several years to make up the difference in price. Whether you are flipping or only planning on staying in your home for a couple of years, it's important to make improvements that you will enjoy but beware of things you will spend excessive cash on that will not affect the re-sale value. Consulting with me, before you make improvements will get you necessary information regarding resale value, before you make the investments. Again, you may still choose to make the changes but now it's an informed decision. The #1 financial mistake that you can make, is not understand who is representing who in a real estate transaction. Unless you are in fact the market expert and have negotiated for multiple properties, it's a good idea that you have someone like me represent you in the transaction. Many times I find people learn to late... Remember, when you go out and talk to just any agent about a home, you may compromise the bottom dollar value. If they know what you're willing to do to make the bid, you'll overpay, even if you have representation. Make sure I know your concerns, and I'll explore them without pipping your hand. I've heard sellers use the phrase, "I'm waiting for the market to come up." And buyer's will say, "I'm waiting for the market to crash." The reality is, no one can predict, with certainty, what prices will do until we are looking at them in hindsight. When you have the information that proves to them that the market has bottomed out, it's too late. You're going to pay more for the property. Waiting is the answer that every one will do when they, don't have a plan. If you have a plan, you can simply figure out if the plan works right now. If it does work, you buy. If it doesn't, then don't buy. You dictate terms, if you don't wait for the market to make the decision for you. If you'd like help developing your plan, make contact with me? I'd really like to sit down with you. It makes me feel good to see my people making the best home investment decisions. "I'll hire the broker at the open house, because they were the first one to talk to me..."
A vast majority of licensed brokers lack any real experience buying and selling properties. It's ironic that such an important decision with so many financial ramifications can be left to chance, but it is. Hiring a professional is absolutely imperative. You should always be able to come back to me and be able to comfortably discuss how your home investment is doing. If goals are never discussed, and the market isn't performing, there's a disconnect, and you'll be back to square one in finding a quality resource who can keep and eye out for you and your investments. Always feel free to make contact with me. "I think we need to buy a fixer-upper." The biggest mistakes are made when the plan relies on something happening in the future to make the investment work. A solid plan will allow for modest growth and cash flow with a minimal amount of risk in the long run. Because most people do not have a plan, they continue to wait and wait and wait for that perfect property. They wait so long they often miss out on all of the deals and have to settle. They may spend more money and miss out on income or appreciation that is happening at this point. "The bubble is going to burst!" Everyone has questions, yet very few pursue the answers. Because we have come so far with technology nearly everything we need to know is quickly accessible. At a time when so much is available, many still make the mistake of being uninformed. Information gives you options, and options give you power to make the best decisions. Much like a medical doctors, most households need a real estate resources. Without this, small changes both good and bad in the real estate world go unnoticed. If we have a good relationship between us, our friendship will grow through the years and allow the you to continually evaluate whether your plan is working or if it needs adjustment. Speaking of staying informed... Did you know, I like to post fun facts on Seattle happenings and King County real estate trends? Follow me on https://twitter.com/eliseswalk. Remember, I'm working hard to be your best real estate broker in Seattle. Let's talk about your future home plans and get set some realistic goals for your up-and-coming real estate transaction. Click the menu button at the top of the screen and call me today. Q. How long is a home expected to be on the market? Q. When's the best time to sell my home? Negotiating a property to the best possible price is the one way to build instant equity into your property. Remember that buying the property is the key to your real estate investments. So, this is how I get a seller to take less than they should. I believe, most get to caught up in the back and forth game of countering each other until they meet in the middle. Lots of buyers like to identify the perfect property in a love letter to the seller and then later make a strong point that this property isn't actually perfect. Then, the buyer proceeds to point out each problem area and attach a price tag to it. Instead of thinking this way, I like to research the homes sold around it, look at the quality, and make a good bid coming out of the gate. No one wants to feel nickel and dimed. When I write our offer, I want to make sure the fees are paid for by the traditional parties. In doing this, no one feels blind sighted at the closing table. Sometimes, a buyer may want the seller to pay for the closing costs; I've found, it's best to negotiate these requests before the offer is written. Also, it's not advisable to have long contingency periods (time it takes to run inspections and get the loan in order) unless absolutely necessary. No one wants to wait for a 20-days when the other offer on the table can figure things out in 7 days. When you say, "This is my final offer," make it your final offer. Be ready to walk away and also be prepared to offer the same final offer one last time. Many times, I've found, when the seller has had a chance to sleep on it for a night or so, they're much more willing to agree, so long as it's close to what they wanted to see. In your final and best counteroffer, I've found it's best to write another letter to introduce yourself again. Many times, in a multiple bidding situation, it's best to separate yourself from the sharks. Take time to say you appreciate the seller for taking the time to negotiate with you and remind them you'll be moving along to the next home, without a YES to your counter. 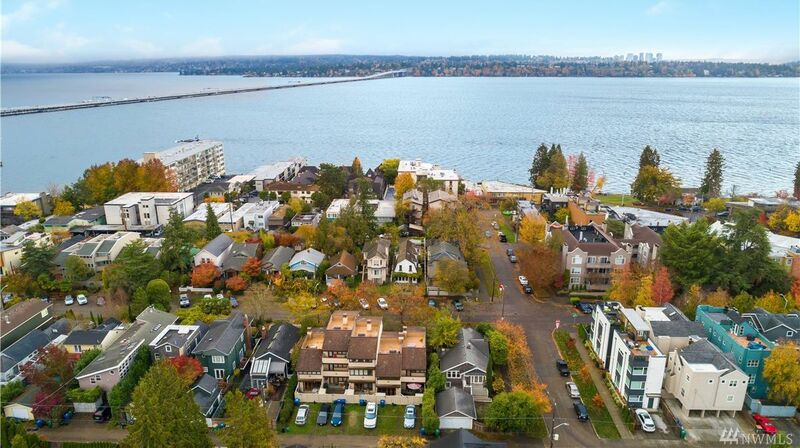 When on the hunt for the perfect townhouse or condo in the Seattle area, you need to take into consideration the HOA you will become part of. Knowing the differences between a condo and PUD homeowners association could alter which type of property you want to purchase. Great question asked by two different clients today. What’s the difference between a PUD and a CONDO HOA? First and biggest difference is that a planned unit development homeowner association and a condominium homeowner association: So, with a PUD you own your land and with an HOA you do not. A lot of times you have to fix the outside of our home in a PUD and a condominium you do not because the condo association owns the land. So generally speaking your fees are a lot higher in a condominium versus a PUD. Interesting fact! A townhome can be in a PUD or a CONDO HOA. The only difference is the condo HOA owns your land, the PUD you own it, so there’s a lot less area maintenance and a lot less fees. For example, today I showed two townhomes not more than a couple of miles away form each another. One in a PUD and one in a condo. The only difference was the fees. The fees were $181 in the PUD and $495 in the condominium HOA. WOW! They both had pools, play areas, barbecue areas, park like setting, beautiful. What does this mean for you? You might qualify for more money if you were to go about getting a home in a PUD versus a condo. The good question to ask your loan strategist is, what’s your max monthly payment? At the bottom of my website, I have a little loan calculator that tells you what your monthly payment will be for your loan. All you need to do is factor in the few things your loan strategist tells you, like homeowners association dues, your taxes and your insurance. Call me when you’re ready to purchase a home in the King County? Let’s get to work! Let me know if you have any questions. I’m around when you need me.